Photos courtesy of Brian Roache & George Beppu. On December 25, 1967, promoter Ed Francis presented a professional wrestling card on Christmas night at the Honolulu International Center (Blaisdell Center) before 8,000 fans. 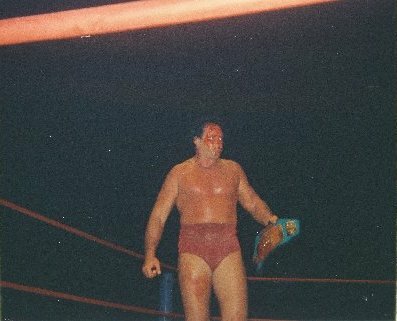 Seven matches took place that night. 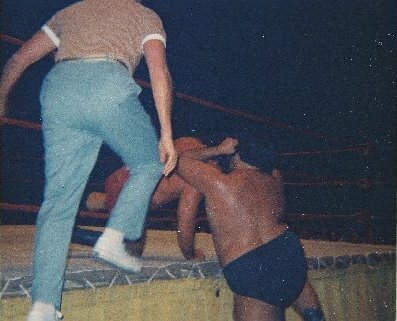 In the first three matches, Cyclone Negra pinned Nick Kozak, Jim Hady applied the sleeper hold on The Alaskan to win his match, and Angelo Poffo drew with Nick Bockwinkel. 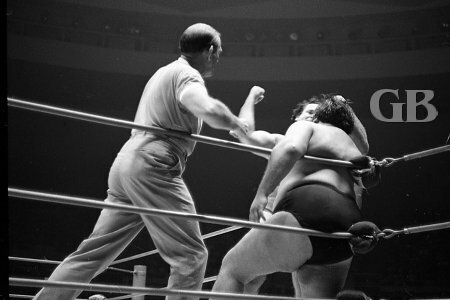 In other matches, Freddie Blassie used knee drops and a body press to take two of three falls from Billy White Wolf. 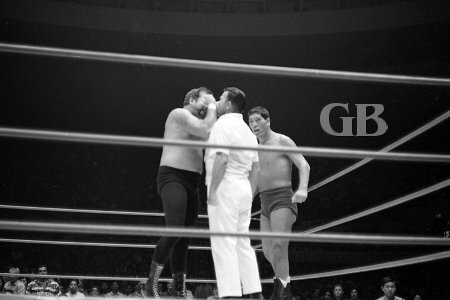 Kenji Shibuya and Ripper Collins defeated the team of Victor Rivera and Pepper Gomez. 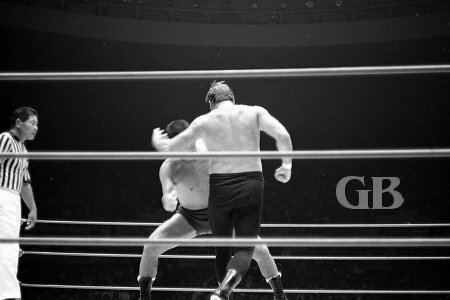 In the semi-main event, Giant Baba was awarded a disqualification over Dutch Schultz to win his match. White Wolf signs autographs for the many fans. 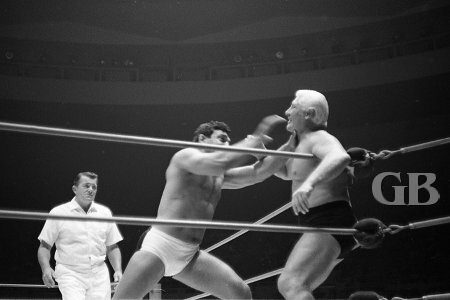 Bashing Blassie's head into the turnbuckle. White Wolf wins the second fall. Schultz has a beef to pick with Pete Peterson, the referee. Fast and loose in the middle of the ring. 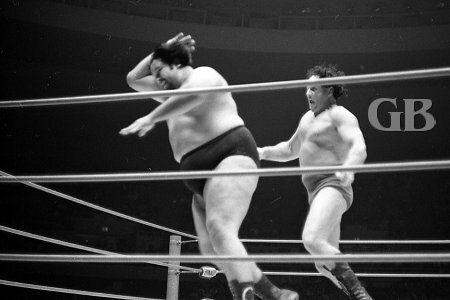 Baba about to throw Schultz into the turnbuckle. 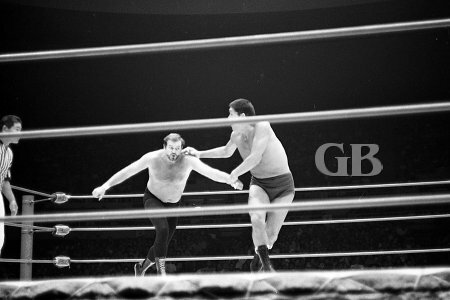 Schultz throws a mean elbow at Baba's jaw. 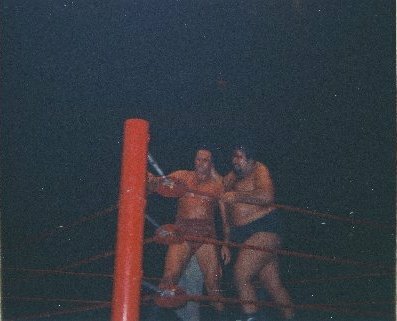 The main event had Curtis Iaukea and Johnny Barend doing battle for the United States Heavyweight belt held by Iaukea. 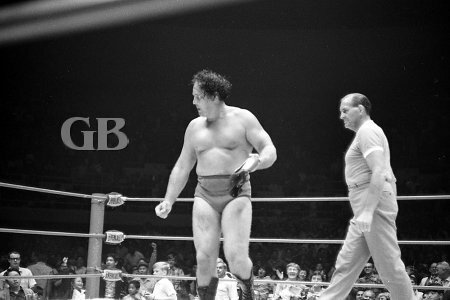 The referee for the match was Paul Boesch, an official for the World Wide Wrestling Association. 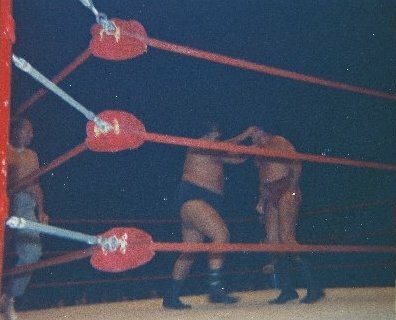 The match had both wrestlers battling each other in and out of the ring. 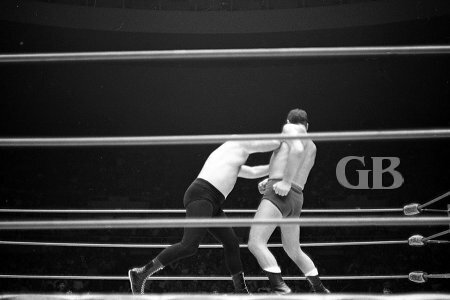 After both wrestlers had gained a fall each, Barend, outweighed by over 100 pounds, won the title the hard way. 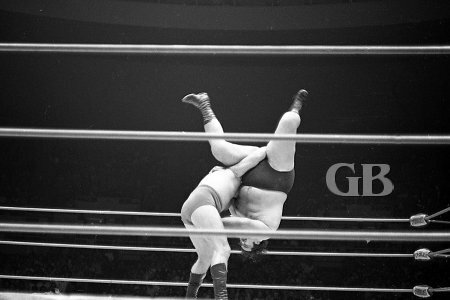 Barend used a back flip to toss the 387 pound Iaukea and applied a press for the clincher. 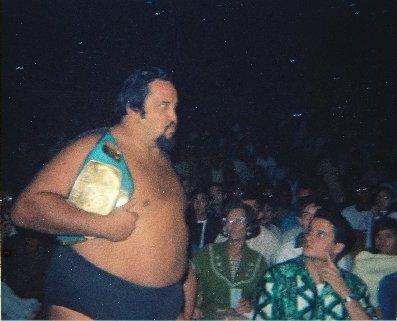 Curtis Iaukea approaches the ring with his belt. Iaukea takes the offensive against Barend. Iaukea slams Barend into the turnbuckle. Iaukea pressed the action from outside the ring. 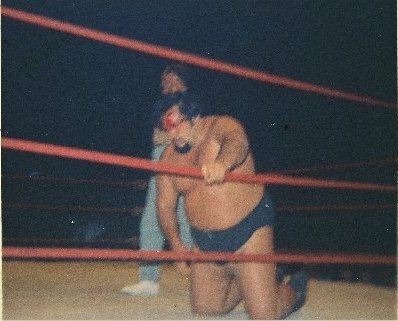 His head cut open, Iaukea slowly tried to get up from the mat. The new United States Champion with his belt. Barend pounds away at Curtis. Body slamming the 350+ pound Iaukea. Handsome Johnny Barend successfully defends his U.S. title. 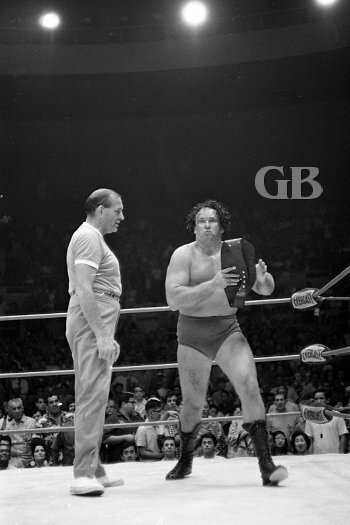 Referee presents Barend with the U.S. belt. 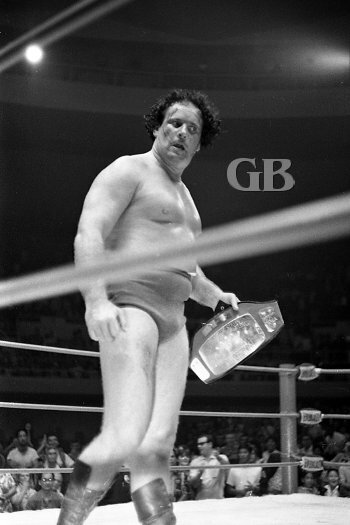 Handsome John proudly displays his hard fought prize, the U.S. Belt.